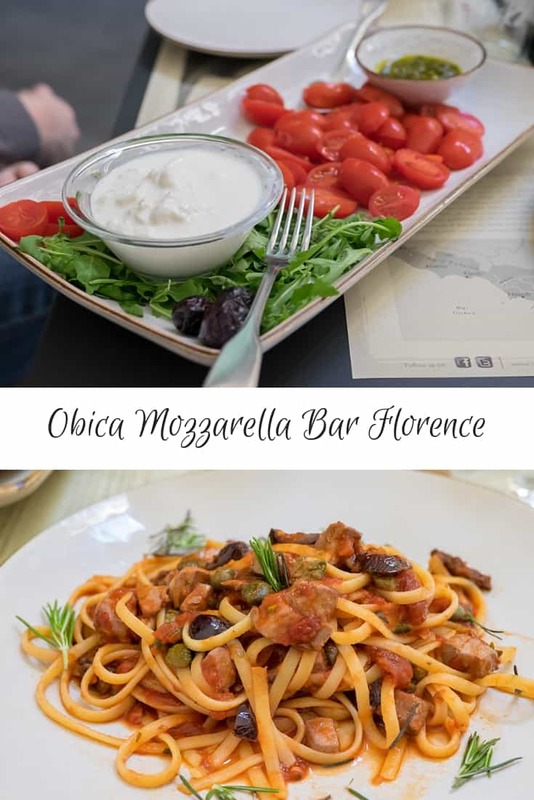 During our amazing Florence for Foodies tour, we passed by Obica Mozzarella Bar, which just happened to be next to the truffle store, Procacci. Our guide Adrienne said it was the best restaurant in Florence for Mozzarella di Bufala. Since that happens to be our all-time favorite summertime meal in the Misadventures household we swore right then and there to eat a meal there before we left. Sometime after 2014, they changed their name from Obika to Obica. Luckily if you search for Obika Florence you will end up with the right search results and website for Ociba Florence! I have no idea why they did the change, but if you look closely at the menu in the 5th photo down you will see that it was Obika! 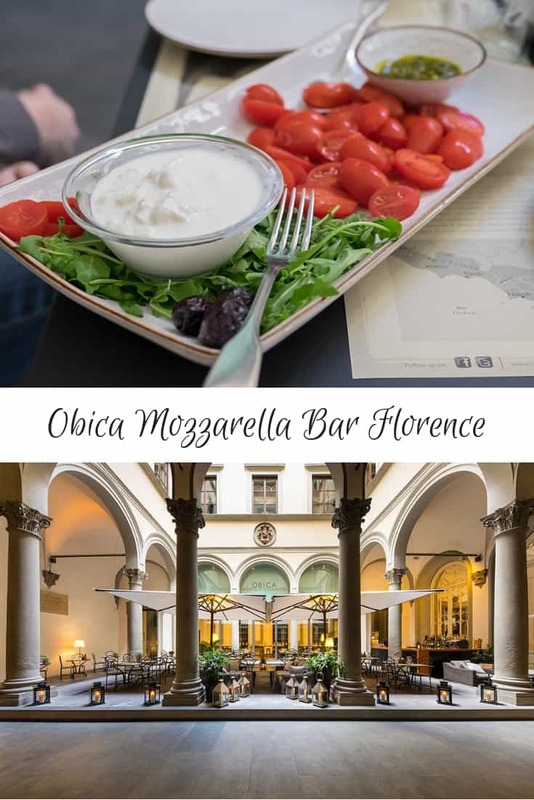 Obica Mozzarella Bar Florence (there are other locations around the world including LA and NYC) is absolutely gorgeous! Part of the restaurant is in an amazing courtyard with a stone floor that was very cooling on a hot day. I never went into the main part of the restaurant (since the terrace is in the front) but from what I saw, it is equally beautiful. It is a minimalist design with lots of natural light, glass, iron and light wood. I guess it is quite similar to how my own house is so I felt at home! As pleasing to the eye as it was, I could not wait to devour the Mozzarella di Bufala Campana DOP. This type of mozzarella is a protected regional product from Southern Italy. 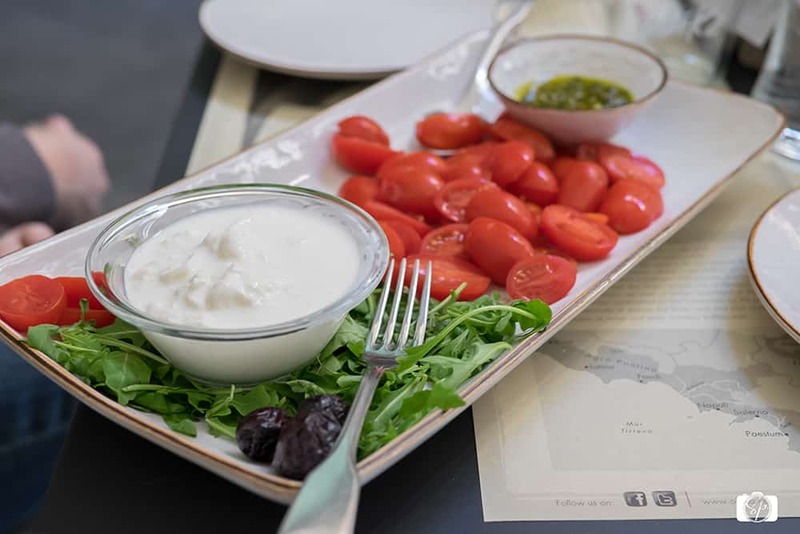 In the U.S. (at least in the San Francisco Bay Area) we don’t get a huge variety when it comes to mozzarella di bufala (or buffalo as we call it), but there are different varietals and at Obika you can try them all. 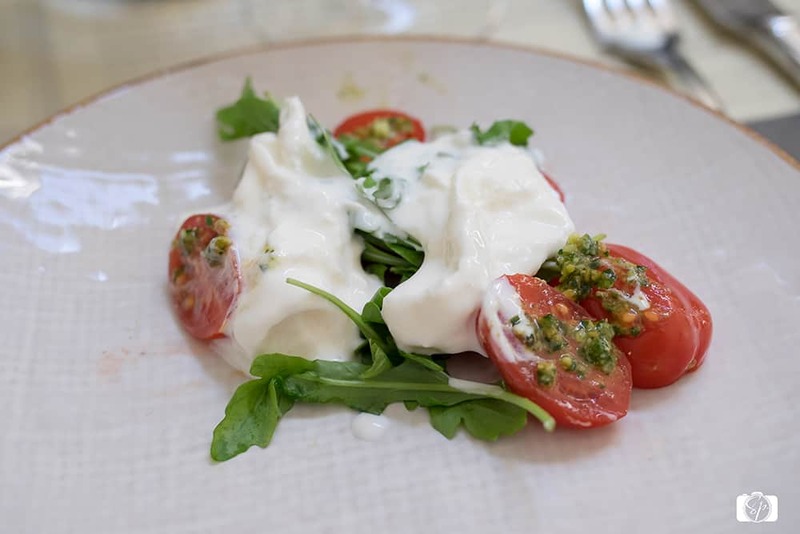 There is the Paestum with a very delicate taste, Volturno with a much stronger taste, Affumicata which is naturally smoked and what most people see in restaurants here, deliciously creamy Burrata. Our choice (and it was hard to choose!) was Burrata Pomodorini served with Datterini tomatoes and basil pesto. If you have never had this cheese, you need to put it on your “things to eat before you die” list. Buffalo milk has higher fat content (about twice the fat of cow milk) which makes it a lot creamier. It is heartier, saltier, and more full-flavored than regular mozzarella cheeses and if you have the opportunity to try some, do it! It is pretty rare stuff in the U.S. I am not sure if they were catering to foreigners (Adrienne said that the restaurant is extremely popular with the locals, the reason why we went for lunch instead of dinner, as it is notoriously busy and hard to get into at night) but the bread was delicious! As I mentioned in my Florence for Foodies tour post, most bread in Italy is not salted and as I am a bit of a salt fiend, I don’t love it. 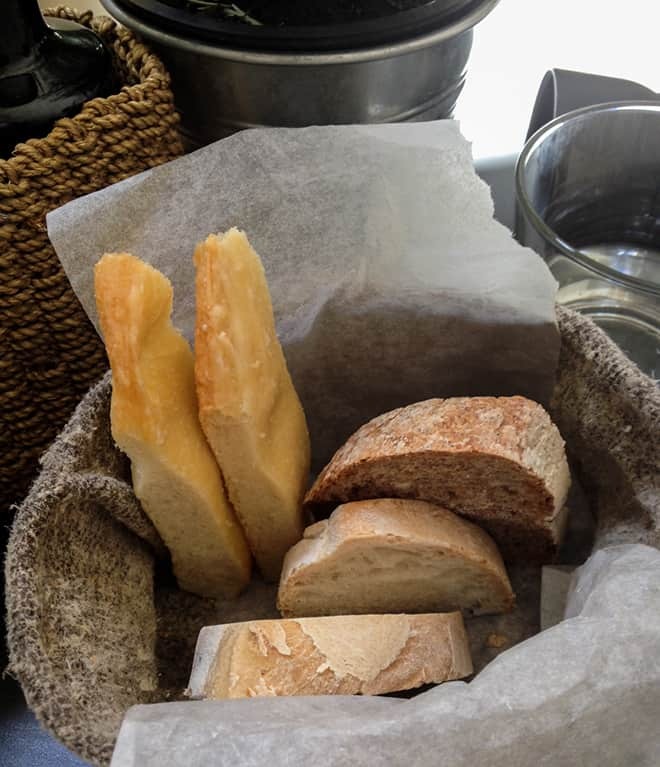 However, with the bread at Obica, I wanted to eat the whole basket! I definitely would have loved to have tried all four of the mozzarella, but we decided to order other items on the menu as well. 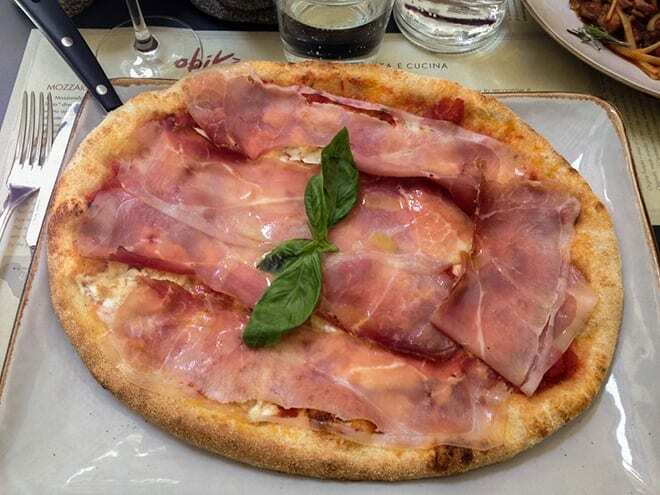 Generally speaking, I am not a huge fan of pizza, but the ones I do like are in Italy. I decided that this was going to be my best shot at a really good pizza since the cheese was so amazing so I ordered Prosciutto Bazzone with premium dry-cured ham from Tuscany and Mozzarella di Bufala Campana DOP. Simple and delicious. The saltiness of the ham with the creaminess of the cheese was a perfect combination. One of the reasons that I loved this restaurant is that it is a Slow Food partner. That means they have made a commitment to support and protect local foods and the artisans that produce them. Little details like the pizzas being prepared with PETRA flour from Molino Quaglia, stone ground with the local soft wheat. As well as a focus on high quality like the fact that their dough is left to rise slowly for at least 48 hours. All these things produce exceptional cuisine. 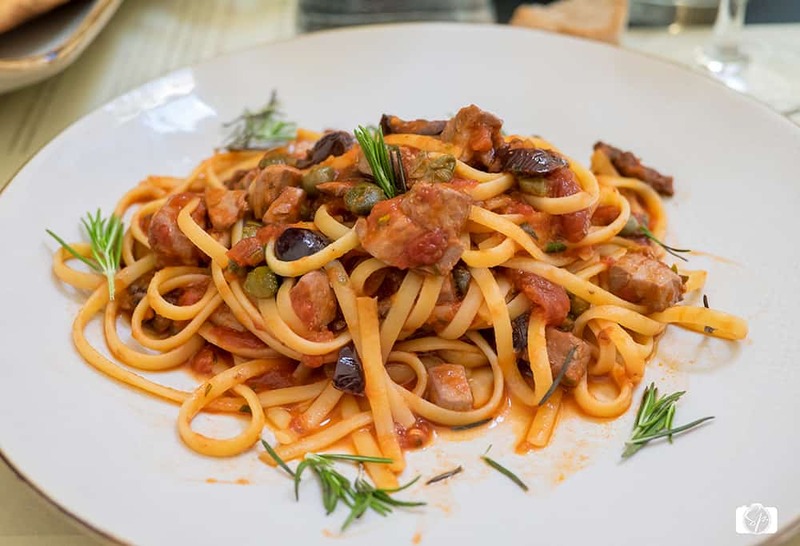 Being part of the Slow Food community, Obica also uses seafood that is sustainably fished, so the Scialatielli di Gragnano ‘Pasta Gentile’ with tuna belly filets, tomatoes, capers, pine nuts and rocket that Mr. Misadventures ordered could be eaten with a clear conscious! The other thing that I found to be fantastico! Amazing! And surprising. At Obika they do not use ANY garlic or onions! I do appreciate these two items, but eaten raw they give me a migraine and sometimes if it is just overused it will make me sick as well, so this was like a risk-free zone, one that I have never seen before! What a treat and one of the best meals we had on our trip. Incredibly friendly staff, aesthetically pleasing decor and darn delicious food, when you are on vacation, can you really ask for more? 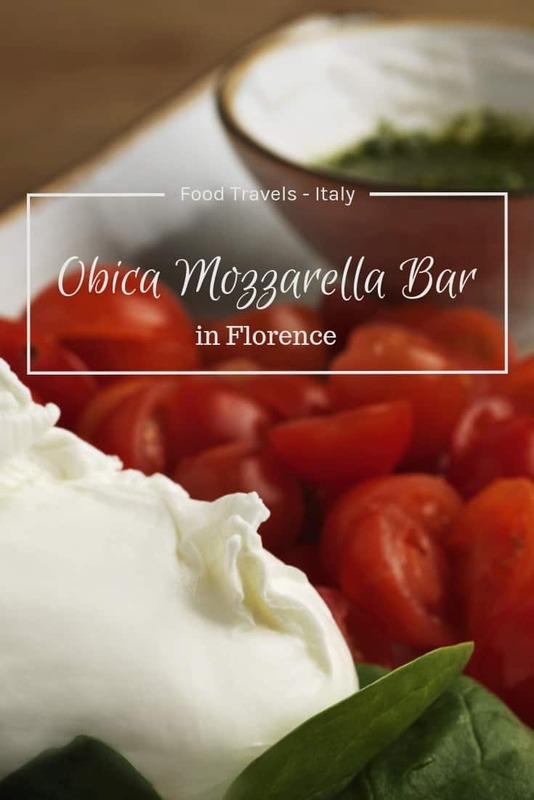 If you’d like to visit Obika Mozzarella Bar Florence now known as Obica Mozzarella Bar Florence, it is located at Via de’ Tornabuoni 16. How about you? Have you tried buffalo mozzarella? Do you like it? How have you eaten it? Comment and share, I’d love to chat! Our Florence for Foodies tour also included a stop at the sinful truffle store Procacci. We experience many typical Tuscan dinners while exploring under the Tuscan countryside and always saved room for dessert, especially gelato! Oh you’re SO making me reminisce about my time in Florence and the fantastic food I experienced there. It looks like you had some amazing meals. @Fi, what was your favorite food memory? 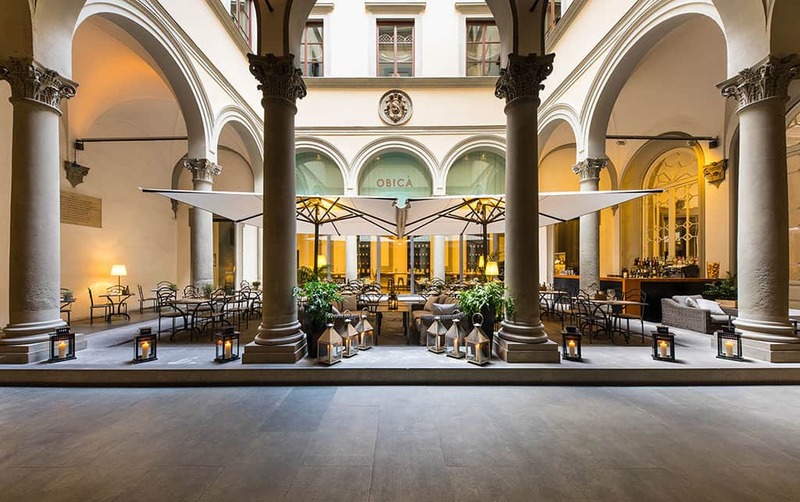 Florence for Foodies? That sounds like the most amazing thing EVER! It’s going on my bucket list. This looks like such a fun place to go. @Jenna, is there any other way to do Italy than the foodie way??! Art, history, museums…sure, but the food! Wowza! This sounds like an absolutely amazing trip! I love cheese and cannot imagine how heavenly Florence was! @Lisa, ah Italy so much amazing cheeses, I could live on cheese and wine alone! I love making and eating mozzarella! Everything in your photos looks absolutely delicious! @Amby, I’ve never made it, I rely on other people like yourself to do it, but I sure do love to eat it! Pretty! And that bread looks delicious! @Lindsay it was and the only decent bread my whole stay! This is not so fun looking at while starving and at work. The restaurant looks beautiful! So fancy! I have never tried anything like that but I would love to, it looks mouth watering! @Starla, I know, the same thing happens to me when I read other food blogs, and I am on a diet! Buratta and Buffalo mozzarella are so yummy! What an amazing meal! @Angela, it was! Where is the best spot you’e eaten it at? Oh goodness, I’m having movie nostalgia type feelings just looking at these pictures. It looks incredible, my heart is going crazy over it, haha. @Lix, do you like Italian food? @Jenn, yes I definitely want to check out the other spots to see if they are as good as the Florence one, I hope you get to eat it in Florence too! oooo – this looks delicious! Florence has amazing food! @Annie, what is your favorite food in Florence? @Karen, depending on which part of Canada you live in, getting to NYC or LAX seems doable, but I hope you get to Florence! @Chelsea, that sounds like my kind of trip! There looks like so much delicious food! If only I was in Florence right now!? @Brenda, I hope you get there one day! Oooooh, that sounds fantastic – and the burrata looks sublime! I’ll have to put that on my to-visit list. I’ve been to Florence twice, and I’ve just loved eating my way around the city. 😀 So many lovely memories of local Florence-cured proscuitto, truffle pasta at Zeb, and so, so many great, intimate meals…. Glad you had a lovely experience, and hopefully both of us can visit the area again! 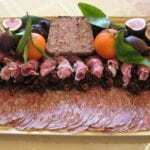 @Lauriel, I did not get a chance to eat at Zeb, but I heard it is delicious. Florence is definitely for foodies! Wow! Such great pictures and descriptions! I went to Florence in 1980 and loved everything, I want to return…. I have tasted Buffalo mozzarella a couple of times, and I agree it is very distinct. I am fortunate to live in Berkeley, CA where Slow Food is very popular but this meal looked fantastic! @Erica, thank you so much, that is so sweet! Everything looks so delicious! Your pictures make me very hungry! The food and pics look amazing! Thanks for sharing this fabulous trip and post with us! I love your site! @Melissa, thank so much for the compliment! This looks beautiful! I can’t eat cheese so it might not be the place for me but I’m sure it’s delicious. @Jessica, that would be a little tough, but they had dishes without cheese, so you could definitely enjoy something. It sounds delicious and the pictures are superb! @Becki, I had read some older news stories about when he was first starting out, I didn’t know he made it, I am definitely going to have to visit his facility! I loved Italy – we practically lived on vine ripe tomatoes, fresh mozzarella and foccacia dipped in olive oil. @Adriane, where did you visit? I want to go with you on your next trip! Looks fantastic! I am so hungry now! I am a total sucker for cheese! This post made my mouth water! This is officially being added to my bucket list! Thanks so much for sharing! @Kayla, I hope you get to cross that off you list! These foods look DELISH! I love seeing new dishes and places. @Deidre, I am glad you enjoyed it! All that food looks really good! Sounds like a fun time. The risotto, which comes from the regular restaurant, is fantastic and my favorite dish. You can order off the Picco menu and hang/sit in the more casual pizzeria. @Lotus, thank you! Thank you! I am definitely going to check them out! My hubby loves risotto so he will love that too! I don’t think I’ve ever had this cheese but now I want to. I’ll put the NYC location on my list. @Tanaya, what was your favorite part of Florence? Oh, I am so hungry now! @Dorothy, they are pretty amazing! oh my gosh, i forgot how much i love real mozzarella. ive never been to italy, but my local shop in brooklyn had the best authentic foods. nothing like it here in portland. @Molli, Portland Maine or Portland Oregon? Both are such foodie towns seems crazy they wouldn’t have it! Oh my, this looks yummy! I will have to whip this up sometime soon! @Brandi, do you know how to make burrata at home? Everything looks oh so delicious! Yummy! The foods looks delicious, i want to taste all those foods, thanks! Beautiful place and beautiful food! What a wonderful restaurant! I absolutely have to visit them if I’m ever in Florence! The pictures are just to die for! @Joanna, I hope you do! I’ve never had buffalo mozzarella! I will need to try this asap! Oh this is making me hungry. Looks amazing. And such a great find in Florence. @Maryann, thanks and it was – I would have never found it without the guide! That food all looks so amazing! I would love to go on a tour like that! I can’t wait to go to Italy someday. @Kayla, I hope you get there one day! Oh my gosh I am so jealous! For us, traveling is more like an eating tour of the Earth! @Tammi, I could not agree more! What a lovely adventure you had!! The food looks divine!! @Elizabeth, it was an amazing foodie experience! Everything look really delicious. I would love try every dish. @Romanita, hope you get to! yum! I am totally cravings some of that food now ! @Kristyn, hope you had something yummy! These dishes look delicious – makes the adventurer in me want to do something spontaneous and off on a travel whim. Travel has been mostly within Canada – yet to venture to Europe….but inspired….vraiment et pour cela merci. @Eva, merci! I hope you get to go on that adventure! I would love the chance to go here myself. I can dream!! @Yolanda, I hope you get there! Wow, everything looks completely divine, and I’m totally jealous. I doubt that we could ever find anything even remotely comparable around here. I love Mozzerella this place sounds so wonderful!! That pasta looks divine! Thanks for taking us on this visually amazing culinary tour and providing pictures! I’ll have to put the NYC restaurant on my bucket list. Thanks for sharing!